Do you have a resolution for the new year: 2016? I am not really a resolution maker because I know I am a resolution breaker. But I do feel that I should start off the year with one thought and that is to start better. A thought provoking question for many, it had me sitting there thinking and I really didn’t listen to the next 5 minutes of the class. What a powerful question. When was the last time I did something for the first time? I have done some new-ish activities since moving to Oxford MS: workshops on gardening at the local public library, opened an Etsy store to sell some jewelry that I was making at home. Other than that nothing was really for the first time because I’ve talked about gardening in other places, sold things I’ve made before and had moved to a new town in the past. I thought and thought that day and simply related things to my current job and current environment: family and location. I vowed that I should work harder to help women with skin care concerns but that wasn’t something new and for the first time. My job with Clinique wasn’t really new because I had been a skin care and beauty consultant in the 1990s before taking a break to raise children. I really could not think of anything that I had done recently for the first time. After much thought and discussion with my husband, I decided that my new first thing would be a new career. I would return to school and get my real estate license. I achieved this by the end of 2014 and began a new career journey. I manage my own business, my own income and all of the responsibilities that come with it. But in addition to this I still do my other things: run my Etsy store, write my blogs, occasionally draw, hold gardening workshops at the local library and hang out with my family. But it is now 2016 and I ponder, again, the idea of starting something for the first time. Clinique’s video asks us to fill in the blank: “I will start _______”. They want us to Start Better. There are a few ongoing projects that I plan to complete in 2016 but otherwise, for 2016, I want to take what I’ve started and be better at it. I want to be a better listener; a better business professional; a better mom, wife, daughter, sister, pet owner, friend; a better contributor to my community. So my resolution is not so much a resolution but an idea that I want to improve myself. January 1, 2016 and every day thereafter that I awake, I want to start better; start better than I did the day before. A daunting task since I am just human and have off days, but I can say that with this desire to start better, I can end the year better. And in doing so I may just do something for the first time and do the things I like to do more often. Did you know you can eat Sea Grapes? Yup, that tropical plant with the purple grapes (or green if you see them only in the Winter while in FL) is a real fruit producing plant. The grapes are ripe enough to harvest in the late summer. Otherwise known as Cocoloba uvifera. You can make Sea Grape Wine, Sea Grape Jelly, Sea Grape Jam, a syrup to drizzle over ice cream or simply pop them in your mouth as a snack. While I have never eaten them, I hear they are a yummy treat but are pretty seedy so beware. Please don’t pick them from the beaches because this plant is protected by state law and planted for beach erosion control. It’s even against the law in FL to pick them from private property without the owner’s permission. But, lucky you, you can grow them in your yard for your own enjoyment and consumption. The plants are not frost hardy so if you get frost in your area, you can pick up some already-made jelly at a variety of historical society offices and visitor centers throughout the state. Ok, so if they’re really seedy is it worth making jelly, etc? Why not? It’s just like making any other jelly BUT, you need to soften the fruit and squeeze it through cheesecloth before you can add the other ingredients and pour the final product into canning jars. Collect only the purple grapes, but remember, do not take them from public lands. Wash and place in a pan. Cover with water and boil until soft. I’ve seen recipes for 30-90 minutes. Just watch your progress and add water if it evaporates too quickly in the boiling process. Here’s the workout: Once the grapes are soft and you can mash them or they feel like they’ve loosened from the seed inside, put the grapes into a cheesecloth and squeeze into a bowl. Be patient, it may take a while to get a lot. Squeeze a small amount at a time to get all the juice available. You can also use a potato masher to squeeze out the juice. When done, toss out the seeds and skin. Measure the juice. For every cup of juice you’ll need to add 1 cup of sugar but not yet. Some people like to add a little water, perhaps to make the total an equal amount of full cups. Ok, now put the juice into a clean pot and add the sugar. Boil briefly then ladle into prepared canning jars. Put the jars in a hot water bath for 10 minutes, let cool, chill and enjoy. VARIATION:There’s another variation for those of you who like exact measurements and pectin. It also calls for butter. I’ve used jelly recipes with butter and didn’t like it. When chilling, the butter rises to the top and…yuck. Put the grapes in a pot and cover with water. Boil for an hour or until the seeds separate from the skin. Drain and mash. Squeeze through a cheesecloth. Add water for a total of 5 cups of juice. Put the juice back into a pot, add pectin, butter, lime juice and boil. Add sugar, bring to a rolling boil for 1 minute and pour into jars and put lids on the jars. Put lidded jars into a hot water bath for 10 minutes, cool, chill, enjoy. One day I will make some but first I have to grow a sea grape tree. 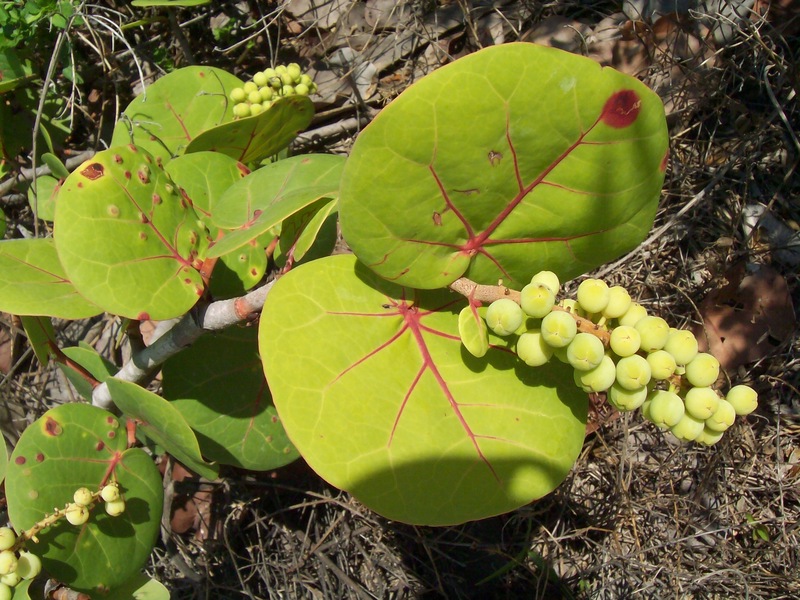 See my gardening blog: acoastalgardenersjournal.com for information on how to grow and care for a sea grape tree. I’ve resisted writing a bucket list. It seems like once you have a physical list of things you want to do before you kick the bucket, it’s a race against time to get it done. There are a lot of published bucket lists on the internet. I subscribe to a blogger who writes about her adventures but also employs others to add articles about their check list. It makes for interesting reading. There is another bucket list you can join. Anyone can sign up for free and track their life’s goals. Well, putting it that way, it’s less of a bucket list and more of a goal sheet. These things include getting married, buying a house, and starting a business. It’s a less exciting list of things to do; not so much a quest as you would probably image when you hear the term “bucket list”. Remember the movie? In recent years I have had a family situation that left me in serious pause as to my life; my brother was diagnosed with cancer. It’s my brother’s cancer but that adds to the family health history. Family health history can cause you to think about your time left on this Earth and the things you would like to accomplish while here. That being said, I decided to do a list for the second half of my life; yes, I’ve reached and now have passed the 50 mark. I am going into a new season of my life and my husband and I have been working on a new 5-year plan. In less than 5 years, our two boys should be out of college (hopefully). Neither my husband nor I were ones to hang around our parents’ houses after graduation so we don’t expect our kids to do that either. I know things can happen and change your plans but we are looking at 5 years, and most likely my sweetie and I will be empty nesters. So, here’s my list of things I would like to do at some point between now and my last day here on Earth, given I have another 50 to accomplish them; or at least 20 or 30 with good health, of course I’m not in control that this. The list is in no specific order and some I hope to accomplish before the boys move out. When I accomplish something on this list, I’ll check them off or score through them with a date and I’m sure I’ll add several new things to this list as time goes by. For now, this is what I’d like to do. Beachcomb the major beaches of the United States. I would like to comb at least one beach of each of the coastal states in the US including the beaches of the Great Lakes where I hear/read of great adventures and wonderful finds. I want to comb the shore of the Chesapeake Bay, Puerto Rico and the Virgin Islands, too. Go on a mission trip with my family. I have lovely friends from each of the states and towns I’ve lived in. I think I’ve talked about them all to each other, so some of them know each other through the great stories I’ve passed along. I would love to get these ladies together for a beach weekend and just have an awesome time. I’d like all of my friends to meet each other. Of course I’m not paying for everyone; just me unless I win the lottery. But you have to play to win and I don’t play. Sorry. A weekend in New York City between Thanksgiving and Christmas with my kids and husband would be awesome. Growing up in Maryland I was close enough to NY to get there between those two holidays. I’ve done the touristy things and would love for my guys and sweet hubby to share this experience with me. Cruise ships scare me. With the recent accidents and fires on board I am not interested in the possibility of getting stuck at sea when I’m not in control of the situation. So the big ship is out of question; however, I’d love a trip on a smaller sailing vessel as a crew member either around the Gulf of Mexico or down the Atlantic seaboard. Tour the California Wine Country. If I ever get to Europe, I’d have to comb the beaches there. So, beach combing European beaches is on my bucket list. I want to find some glass fishing floats, too. I would like to have collected one of every sea shell available in North American. I’m really close to this goal. I want to see as many North American species of birds throughout my life as I can. Any birds in other continents is lagnaippe, or a little something extra. Beach comb a particular beach on Key West. A friend told me about a specific spot and I want to check it out. I’d love to have a wine named after me. “Eileen” is not exactly a catchy wine name so it would have to be something that reflects who I am or a nickname. It doesn’t have to be highly marketable, just named after me. I just want to drink one bottle and then put the other bottle on a display shelf. Of course, if it’s really a fine vintage, I’d like more than one bottle to consume. Take a trip to Alaska. A friend told me about an experience she had kayaking near the glaciers that was so awesome. I also have a sweet friend who lives in Alaska I was hoping to visit but she’s moving back to the lower 48. Go to Aspen Colorado during ski season just to hang out. I gave up skiing due to an injury (bummer) but can still hang out. Podcast a radio show about stuff I like and actually have people that listen on a regular basis. Go to all of the US states that I haven’t yet been to. I’ve traveled 31 so far. Live on boat: sailboat or house boat. Travel on my beachcombing excursions in a restored VW bus, the one that’s retired or a classic Woody. Buy a GoPro for my adventures. What do you really want to do with your life? Have you already done it? Are you half-way there? Have you even started on your path? What makes you tick? What makes you happy? Where do you want to be in 5 years? 10 years? Next year? My children go to the University of Mississippi and one sings with the Men’s Glee. Tonight was the Holiday Concert and I (a coastal fanatic) was delighted to hear, not just my son, but the Ole Miss Steel Orchestra. A Steel Orchestra in North Mississippi. How cool is that?? I can’t make it to the coast for the holidays this year but I felt like I was there listening to Christmas songs played on steel drums.